What they do: America’s Grow-a-Row is a 501(c)(3) not-for-profit organization located in Hunterdon County, New Jersey that grows and gleans fresh, healthy fruits and vegetables that are then donated to hunger relief agencies throughout the state of New Jersey, in New York City, and in the Lehigh Valley and Philadelphia in Pennsylvania, and distributed at Free Farm Markets in impoverished neighborhoods. As part of its mission, America’s Grow-a-Row educates people of all ages about the hunger crisis, nutrition and healthy eating, and agriculture. How they do it: America’s Grow-a-Row began in 2002 with the efforts of a single volunteer, Chip Paillex. That year Chip, with the help of his 4-year old daughter, Kyra, donated 120 pounds of fresh produce from his home garden to the Flemington Area Food Pantry. When Chip saw the need for fresh fruits and vegetables at local food pantries, he became inspired to grow produce to feed the hungry. Thanks to Chip’s leadership, an ever-expanding volunteer network, and regular invitations to glean excess produce at local farms and grocery stores, the program has grown exponentially. Fifteen years later, America’s Grow-a-Row impacts 175,000 people annually through its multi-level strategy. In 2017, America’s Grow-a-Row donated over 1.5 million pounds of farm fresh produce and since inception has donated over 7.7 million pounds – or 30.8 million servings – of fresh fruits and vegetables to neighbors in need. America’s Grow-a-Row expanded their service area in 2017 to include soup kitchens, food pantries, and other community food programs in New York City through their collaboration with City Harvest. America’s Grow-a-Row donated over 540,000 pounds of farm fresh produce to City Harvest in 2017. Latest project/campaign: America’s Grow-a-Row is reconstructing its existing commercial kitchen into a child-friendly Farm to Fork Juniors’ Kitchen and renovating its barn into an education center. These improvements will create space for educating their produce recipients and volunteers of all ages about healthy eating and nutrition, the hunger crisis, and agriculture. Major Funding: America’s Grow-a-Row does not accept any state or federal government funding. America’s Grow-a-Row is supported by numerous private and corporate foundations, individual giving, and several fundraising events throughout the year. At the completion of the 2016 audit, it was determined that 84% of their total expenses were programming-related. Interesting fact about how they are working to positively affect the food system: America’s Grow-a-Row provides access to their farms for community groups, corporations, schools, and agencies. Participants have an opportunity to plant and harvest produce and to learn about where their food comes from and about the food system. Volunteers also glean food from partner farms and local grocery stores to help reduce food waste. In 2017, over 9,100 volunteers participated in the America’s Grow-a-Row program. 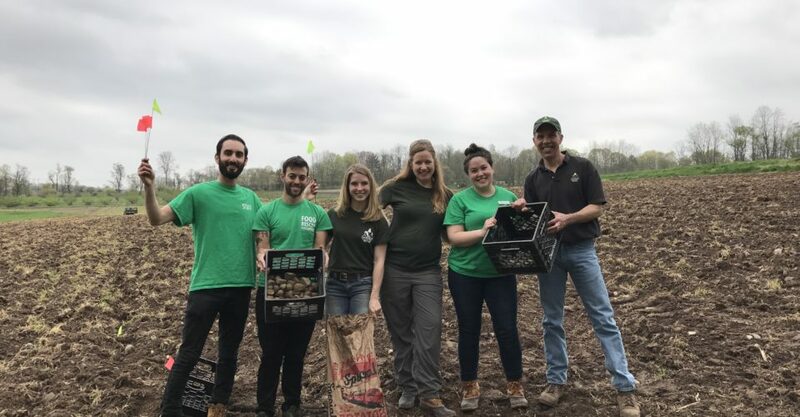 America’s Grow-a-Row operates on two farms in Milford and Pittstown, New Jersey, where volunteers from the community, corporations, schools, and agencies assist in the planting of seeds and seedlings and in harvesting crops. Volunteers also glean excess produce from farms in Hunterdon, Morris, and Warren counties in New Jersey and rescue “not quite retail perfect” produce from local grocery stores. Growing, Gleaning and Giving: Plant and harvest, through a volunteer-based effort, fresh fruits and vegetables for donation to those in need. Fresh produce is delivered to hunger relief agencies throughout New Jersey, New York City, and eastern Pennsylvania. Free Farm Markets are set up in under-resourced areas during the harvest season. Volunteers glean excess produce from partner grocery stores year-round so that fresh produce is delivered to those in need during the winter months. Volunteer Opportunities and Education: Provide hunger-awareness and healthy eating education and an impactful experience for their volunteers with the goal that they continue to participate in the effort to eradicate hunger with healthy food options. Youth Education: America’s Grow-a-Row’s education program delivers engaging nutrition lessons that create greater awareness of the variety of fruits and vegetables and the connection between a healthy diet and well-being. Grow-a-Row Kids Farm Days: Children from the communities served are invited to the farm during the summer months, when they have the opportunity to harvest produce, learn about healthy eating, and play fun outdoor games. Recipient Volunteer Program: Provide volunteer opportunities for the clients so that they can harvest fresh food for their own community and for other communities in need.